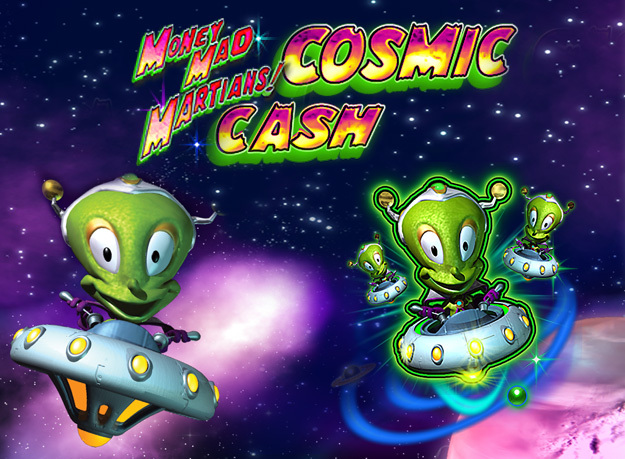 "Experience intergalactic wins when you play Money Mad Martians Cosmic Cash slots! Play the Asteroid and Planet Bonus games and win 500 times your wager!" Money Mad Martians Cosmic Cash slots will shoot you into another galaxy packed with incredible bonuses and prizes! The graphics are stunning and include and starry background and adorable Martian cartoons! The game features the exciting Shuffling Reels and after a losing spin, the reels will shake and rearrange to offer more chances of winning! If you can land 3 Bonus symbols you’ll trigger the Pick Me Bonus to win prizes and a chance to play the Asteroid Bonus game! Take your pick of the asteroids to win multipliers and a chance to activate the Planet Bonus! Watch the planets spin to reveal prizes of up to 500 times your wager!